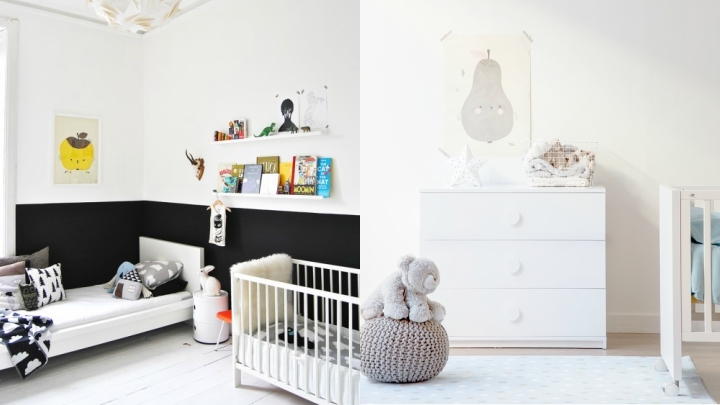 The Scandinavian style is ideal for babys room. The use of light colors, luminosity, natural materials … all the keys of this type of decoration applied to this room make possible the creation of a cozy, very warm and comfortable, the ideal setting for our baby to live. So today, I want to show you some thoughts to decorate your bedroom thus making it a very bright place, using soft tones and very special decorative elements. Soft colors are most appropriate for the baby’s room. And they fit perfectly into the Scandinavian style. For example, you can paint the walls in pastel pink, in a beige, pearl gray or mint green. The color white is sure hit, since it is the basis of this decoration and is a very relaxing and bright color. You can enter color details in the decorative objects or put wallpaper on any of the walls. In a baby bedroom with Scandinavian style the sheets on the walls look great. You can choose different reasons for this, with illustrations of fruit or animals, for example. On a neutral basis in the rest of the decoration they will highlight a lot, adding a color note to the room. You can also play with textiles. In the cradle, place a blanket gordita protruding above the bars, and do not forget the pillows, essential in this type of decoration. Precious are those that are shaped like cloud or star, for example. Put some carpet to give greater warmth to the environment. Natural light is essential in the Scandinavian style. Therefore, try to make the most of it in this room, placing light curtains to let the sun rays through but without overheating the environment. In addition, you can put artificial lighting as a ceiling lamp that illuminates generally the room and other points of light as spotlights, smaller on any side table lamps or a garland of lights to give it a cozy and different touch to the environment. 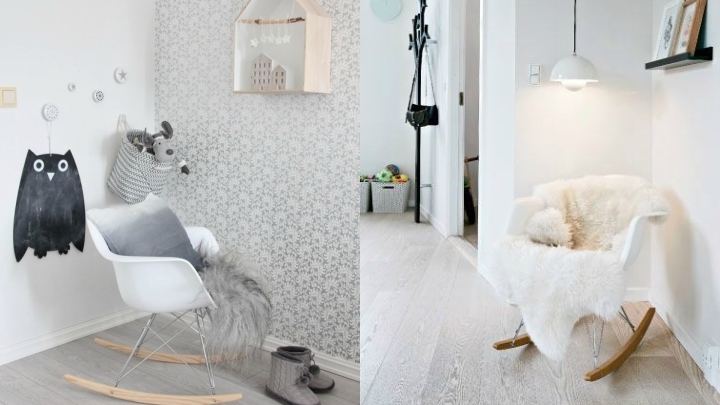 The Scandinavian style has signs of identity that make it easily recognizable. Eames chairs, for example, is one of these elements that we see in this type of decoration. In a baby’s room will look amazing one Eames rocking chair type; You can place it in a special corner where you can relax with your baby. It is very decorative and practical at the same time. Put some long-haired carpet on the floor, or on the chair itself, some doll or decorative object on the wall, and you have managed to design your special place, exclusive for you. Natural materials are the most appropriate in this type of decoration. Opting for wood flooring and furniture, if a color clarity much better. If you place the wooden floor and the white walls, for example, you can add color to the cushions, sheets or clothes of the crib. The Scandinavian style bets on simple furniture, without great stridency. Therefore, the crib should be so, usually white, with simple lines and straight . You can place a chest of drawers or an exchanger, of wood in light tones, and it will not be necessary much more. With some decorative elements that can serve as storage (wicker baskets, wooden boxes …) and that complement these furniture will be more than enough.